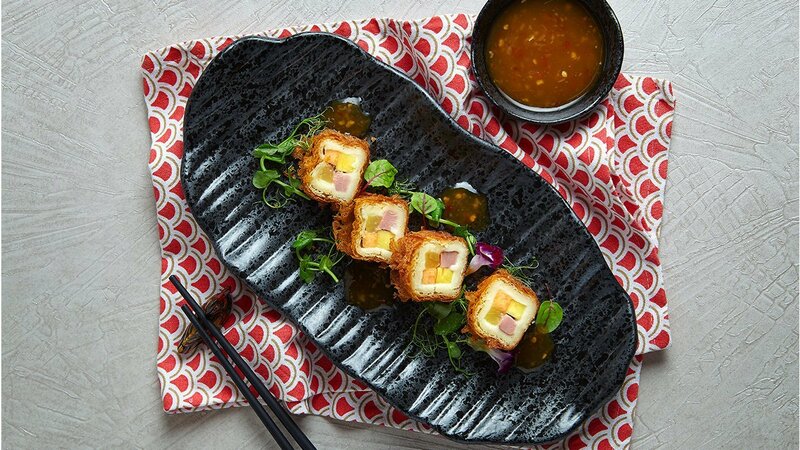 A tantalising addition to any Chinese New Year menu, this dish of sweet and juicy duck rolls will delight both your diners and kitchen staff – because of how delicious, yet easy to prepare - it is. All thanks to one secret ingredient - Knorr Rock Sugar Honey and Knorr Concentrated Tamarind Sauce. Whisk mashed potato powder thoroughly with water. Add hot water to wheat flour till well mixed and cooked. Mix well 2 portions of mashed potato with margarine, shortening, chicken Seasonings powder and salt. Set aside. Portion smoked duck breast into two, cutting one half into strips and the other half into thin slices. Set aside. Take 80g of mashed potato and mould into 15cm x 15cm portions, lay smoked duck strips and fruit strips on top and wrap into rolls. Coat with mashed potato powder and set aside. In a pan, heat oil to 60% hot, deep fry the smoked duck rolls over low heat till golden brown. Drain off excess oil and set aside. Lay the smoked duck slices in the centre of the plate, halve the deep fried smoked duck rolls and place them on the duck slices. Mix well the seasonings and pour over the duck rolls. Ready to serve.